Will 2020 be a good year for football video games? I was inspired a few weeks ago by a Twitter post from Ryan Moody (@ShutdownSafety), who asked why people are being so negative about football video gaming, and why people aren't making content. Well, I decided that I'd make some content sharing some of my optimism about the future of football video gaming in the next few years. I posted a video to my YouTube channel, but loyal blog readers can read the full transcription here. YouTube: Will 2020 be a good year for football video games? Football video games have been in a rut for a while now. 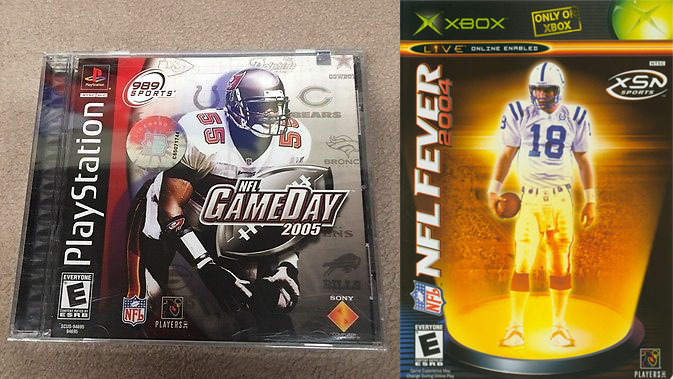 The exclusivity deal between the NFL and EA didn't only kill NFL 2k series, it also may have killed the NFL Gameday, NFL Fever, NFL Blitz, and other series as well, some of which had game releases as late as 2004. All Pro Football 2k8 is now eleven years old. Backbreaker came and went nine years ago, leaving EA as the only major publisher still making football video games. EA's own NCAA Football series is now in the fifth year of its hiatus (the optimist in me still prefers to use the term "hiatus" instead of "cancellation"). This has all left football video gamers with nothing but mediocre Madden releases for years. EA's NFL exclusivity may have put the final nail in the coffin for other games besides just NFL 2k. All that being said, I am actually very optimistic about football video gaming come 2020 or 2021. First and foremost, Madden's 5-year complete monopoly on consoles was broken this year with the releases of Canuck Play's Maximum Football 2018 and Axis Games' Axis Football 18. For the first time since 2013, there are football games on consoles not called Madden, and for the first time since 2009, there are football games on consoles that are not published by EA. So why do I still consider football gaming to be in a rut? We finally have some competition in the football video game sector! 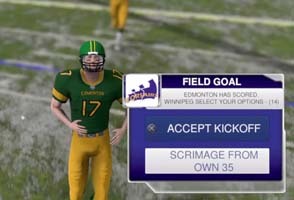 Canadian developer Canuck Play recently released PS4 and XBox One versions of its Maximum Football 2018 game. Canuck Play is a small, independent studio with limited staff. In fact, I couldn't find a count of how many employees or developers they have, so as far as I can tell, the whole game was developed by one guy: David Winter. The fact that he could single-handedly put together a functioning football game is, itself, a pretty impressive feat. I wish I had the time and drive to do what he's accomplished. Maximum Football 2018 is a $17 budget title, so I went into it with pretty low expectations -- as should you. I bought it because I want to support indie developers, and I would love for Canuck Play to eventually grow into a studio with the skill and manpower to challenge Madden. I'm not going to lie though, Maximum Football is not there yet. Not even close. How do I even play Canadian football? Being a United States resident and fan of NFL and NCAA college football, I admit that I have only a passing familiarity with some of the rules variations of Canadian football. There was a Canadian football team in my home town for a couple years (the Las Vegas Posse), and my dad and I did attend the games. I remember the basic differences like there being twelve players on each team instead of eleven, three downs instead of four (which encouraged more passing), more generous backfield motion rules, 50+ yard field goals being worth four points instead of three, and a longer field and deeper end zone. But there are a lot of other rules changes that I don't know, and even in the cases of the rules that I do know, I do not understand the strategic nuances of playing under those rules. Canadian football has some significant rule variation that I don't know the strategy for. As such, I was very disappointed to see that Maximum Football 2018, which is a Canadian football game, does not include any sort of tutorial or training mode (that I could find). There is an option in the settings menu that allows the game to automatically snap the ball for you after the pre-play motion(s) are complete, but there's nothing in the game that explains how these motions are supposed to work, or how the offense is supposed to utilize them. 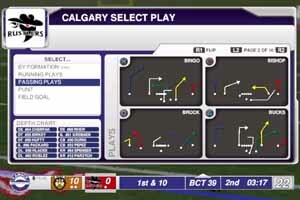 There's no in-game commentary to possibly provide the player with any insight into the intricacies of Canadian football. Not even so much as some splash screens with some diagrams and explanations. There is a practice mode in which you can test out the playbooks, but you'll have to learn everything through trial and error. The waggle concept allows multiple offensive players to go in motion before the snap. To compound this issue, the game lacks explanations for some of its own mechanics and conventions. Receiver routes are highlighted in up to five different colors: red, yellow, blue, white, and sometimes green. What do these colors mean? I assume that one of them is supposed to be the primary receiver and one is supposed to be the hot receiver. So what do the other two colors mean? Are they supposed to represent the QB's receiver progression? If so, then in which order am I supposed to read them? Do they represent the types of motion that they perform before the snap? If so, then it would be nice to have an explanation of how these motion concepts work. What do all these colors mean? It doesn't get any better on the defensive side of the ball. Heck, it gets worse. There's no pre-snap defensive play art at all, nor is there any defensive player assist. You're stuck having to decipher the small play art that is shown in the play-selection screen. You have to remember the assignment of whichever defender you happen to select, then fulfill that job completely manually without any in-game indicator of what the player's assignment actually is. The safest options, therefore, are to always select a defensive lineman (despite there not being any controls or mechanics for breaking blocks or steering blockers), or play a safety in zone coverage (if you can actually figure out which safety is in zone coverage).